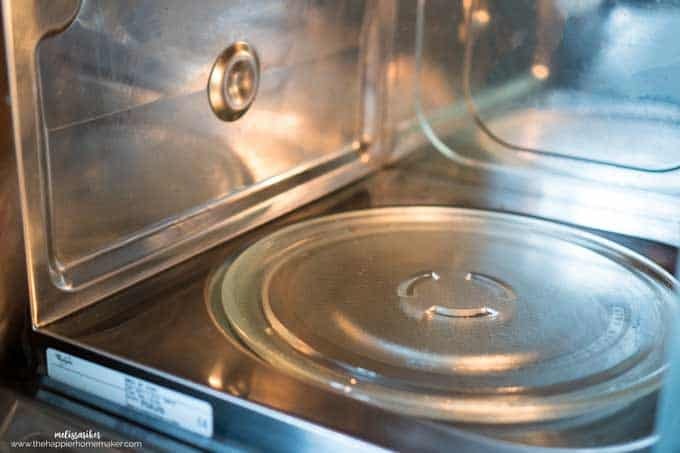 Wondering how to clean a microwave with steam? It’s so easy! 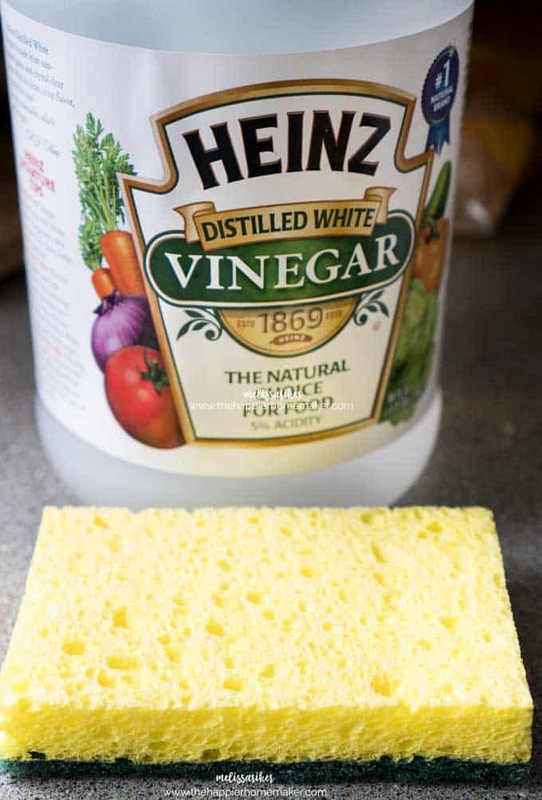 Once you learn how to use vinegar steam to clean your microwave you’ll never put off cleaning it again! 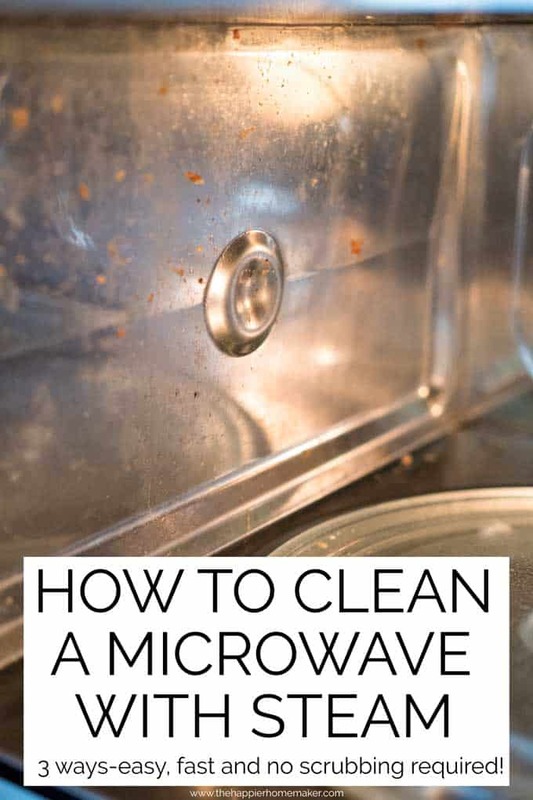 Read on to see how to clean your microwave fast! It’s the worst, isn’t it? You’re microwaving something and heard the dreaded POP of food being splattered everywhere. Worse yet, you’re like me with kids (and a husband) who don’t pay attention to messes in the microwave and you open it up only to discover crusty food caked on the sides and top. When I was younger I would scrub away at that grime and I always wondered how to clean a microwave fast. Then I learned the answer: clean the microwave with vinegar steam! 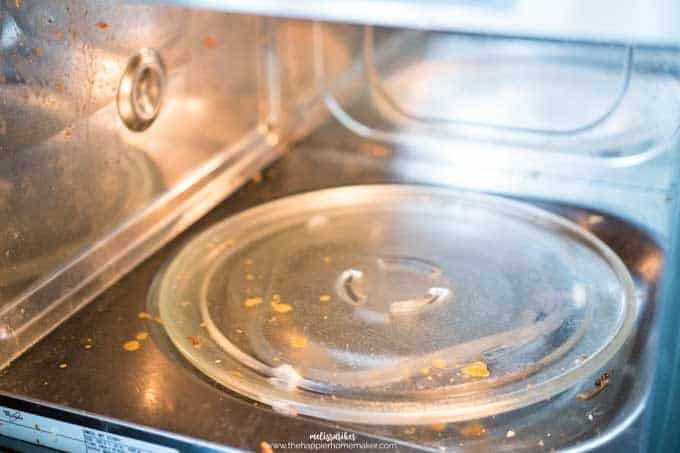 Save yourself the time and energy of scrubbing the microwave, here are three easy ways to use the power of steam to clean a microwave fast and easily! This is my preferred method that I use at home 99% of the time. 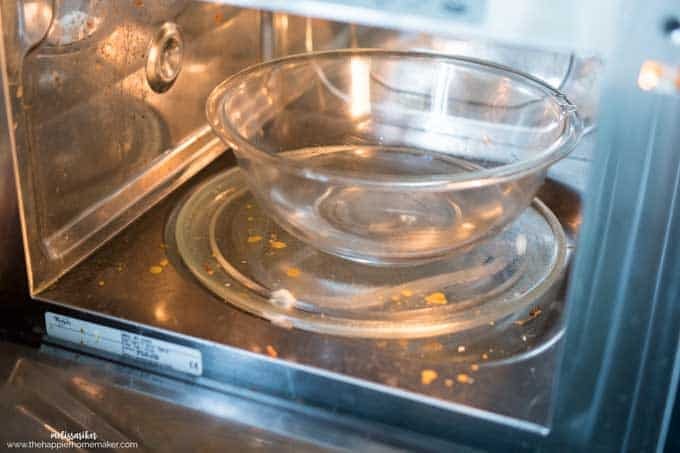 To clean the microwave with vinegar steam you’ll first pour equal parts vinegar and water (I use one cup of each) in a medium microwave-safe bowl. Add a chopstick or toothpick to the bowl-this breaks the surface area of the water to help prevent superheating and “popping” of the water than can leads to splashes and burns. Microwave the vinegar water on high power for 7 minutes, then allow it to sit an additional 3 minutes without opening the door. When you open the microwave door be cautious of the built-up vinegar steam. Carefully remove the bowl and the turntable-both will be hot. Use a damp sponge to wipe down the sides, top and bottom of the microwave-it should wipe clean easily. Wash the turntable in the sink and you’re all done! Easy-peasy! I published this method years and years ago but I rarely use it anymore. First, because sponges in general gross me out! Second because I find the bowl of water method to be more useful because it releases more steam. But, if your microwave isn’t too dirty and you’re in a rush simply saturate a sponge with water, pour a tablespoon or two of distilled white vinegar on it and microwave for 3 minutes. Again, let it sit an additional 3 minutes then carefully open and remove then wipe out the interior. As a bonus this method can cleans your sponge in the microwave as well! I don’t use this myself but I recently saw a friend with one and was impressed with how well it worked. It uses the same principle as both methods above by allowing the water/vinegar to steam and loosening the grime. Cute right? So, if you don’t mind spending the few bucks and want the amusement of the angry mama, it’s a great effective way to clean your microwave as well! Now that you have three options for how to clean your microwave with steam, which will you try? Let me know in the comments! Great advice. I cringe every time my husband uses the microwave because I know it will be a mess. Hy James and the guys, guess what? I met Steve Redgrave earlier…listening to his stories has made me want to take up rowing…….It was oar inspiring.